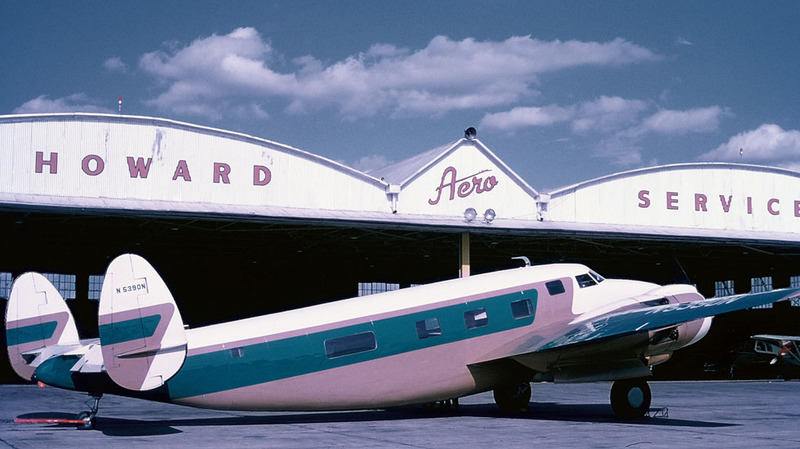 The Howard 500 has had a long and colorful history since its creation in 1959-1960 when it was designed as a corporate plane and luxury liner for the elite. In the early 1960s, Chicago Gas and Pipeline bought it, followed by Southwest Forest Industries in the late 1960s. In the mid-1970s, the Howard 500 went to Florida and Tennessee where it was said to have been owned by Elvis Presley. After that, it was sold to a directional drilling company in California, flown for the owner, then parked in Nevada for several years. That’s where its next owner, North Pacific Management Corporation of Portland, Oregon, found it in 1995-having only flown about 15 times in 10 years. The company spared no expense to completely refurbish the plane. Shortly afterward, the plane, piloted by David Cummings of North Pacific, won the Contemporary Grand Champion Lindy Award at the 1997 EAA Oshkosh Convention. After North Pacific’s owner passed away, the Howard 500 and its sister plane, Serial Number 009, were eventually sold to TP Universal Exports, LLC of Eagan, Minnesota where the 500 has been flown regularly-and frequently internationally for many years.